Dr. Le is currently a 4th-year Radiology Resident at the University of California, San Francisco, CA. He attended the Medical Scientist Training Program at the University of Minnesota, Minneapolis, MN and completed his PhD in Biomedical Engineering in 1997 and his MD in 1998. Dr. Le will remain at UCSF for a Neuroradiology Fellowship following completion of his residency program. The development of magnetic resonance imaging (MRI) represents one of the greatest achievements in medical imaging. No other modality in the field has progressed as rapidly in its first 30 years. 1 During this brief period since its first introduction in 1973, innovation in superconducting technology further accelerated development of MR technology, allowing imaging at field strengths of >=1T. The desire to perform human studies at higher field is related to the higher signal-to-noise ratio (SNR), contrast-to-noise ratio (CNR), and spectral resolution. The majority of existing clinical MR systems operate in the range of 1.0T to 1.5T. Although whole-body higher field (>=3T) systems were devised more than a decade ago, 2-5 these systems have been available only to highly specialized research institutions. Physicists and engineers had to be present at installed sites to provide daily operational support. Initial high-field experiences were promising but less than satisfactory due to the lack of understanding about the high-field technology and specialized tools designed to operate at higher frequencies. Since then, advancements in hardware and software engineering have made high-field human MR imaging a clinical reality. At present, all major MR manufacturers have received clearance from the Food and Drug Administration (FDA) for their whole-body 3T systems. Around the globe, >50 clinical 3T systems have been installed, with >100 additional 3T systems being purchased or built. Manufacturers also are actively seeking FDA approval for whole-body 4T systems. In addition, the FDA has deemed magnets up to 8T safe for adult humans and up to 4T for neonates >=30 days. 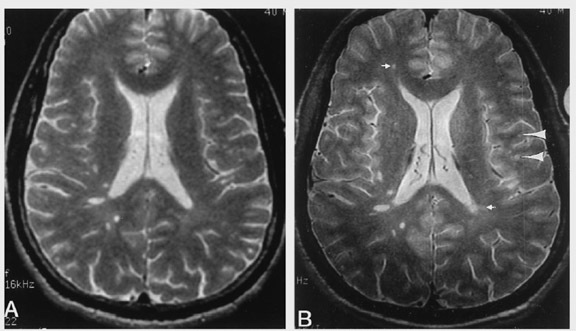 This paper will review progress in clinical high-field MRI. In particular, advantages and challenges of operating at high field will be discussed. Hardware and software innovations addressing the challenges at high field will also be reviewed. Finally, clinical and potential economic benefits of high-field MRI will be illustrated. SNR varies linearly with field strength (B 0 ); therefore, increasing from 1.5T to 3T can theoretically double the SNR. The higher SNR can be exploited to improve spatial resolution by imaging with thinner slices and/or higher in-plane resolution. The higher SNR can also be utilized to reduce imaging time. In addition, improving the temporal resolution has the added benefit of reducing gross and physiologic subject motion artifacts. Higher SNR also benefits spectroscopic imaging. Clinical utility of spectroscopic imaging has been hindered by small concentrations of the targeted nuclei and long measurement times. An improvement in SNR translates to an increase in peak amplitude to background noise ratio for any given chemical species. Alternatively, the improved SNR can be exploited again to reduce acquisition time, making spectroscopic imaging more clinically practical. Chemically different protons in an organic molecule do not experience the same magnetic field. The local chemical environment can alter the resonance frequency of the nucleus, resulting in a shift in the nuclear resonance frequency. The magnitude of the shift for a given proton depends upon the strength of the applied magnetic field (B 0 ). For a given proton, the shift (in Hz) doubles from 1.5T to 3T. Therefore, the increase in chemical shift at high fields improves the spectral resolution of chemical shift imaging. In imaging nuclei other than hydrogen, such as sodium and phosphorous, the inherently low concentrations of these nuclei in biological tissue necessitate long imaging times at lower field strengths. At higher field strengths, spectroscopic imaging of these nuclei becomes more clinically feasible. Modern magnets are based on multiple solenoidal coils connected with >=2 correction coils. 9-11 The design requires that the static magnetic field is homogeneous over a diameter-sensitive volume (DSV). 12,13 A homogeneity requirement of ¾0.5 ppm over 40 cm DSV is typical for modern whole-body MR systems. The magnet may be shielded to reduce stray fields and siting costs. To maintain an equivalent static field homogeneity for a particular diameter, a higher field magnet requires a longer axis of the magnet and/or tighter and more coil windings. The end result is increasing both the size and weight of the magnet. For instance, a 4T magnet can weigh up to 20 tons with cryogens and requires up to 150 tons of steel shielding to contain the 5-gauss line to within a couple of meters of the magnet. 14 To restrict the total length of high-field magnets to the same length as current clinical 1.5T scanners, while fulfilling the above homogeneity requirements is a major production challenge, requiring innovative magnet design. Problems related to B 1 or radiofrequency (RF) homogeneity represent another challenge at high field. 5 Because the Larmour frequency is directly proportional to B 0 , increasing in the main static field also increases the proton precession frequency. At higher frequencies, the RF penetrance through biological tissue decreases. In addition, the increase in dielectric constants of biological tissue at high field interferes with the wavelength of RF in the tissue. 15 The end effects are phase and amplitude modulations of the RF inside the tissue, resulting in unpredictable off-resonance image artifacts. where r is the radius of the tissue (assuming a spherical object) and D is the duty cycle of the pulse sequence. Therefore, for a given body part, the SAR roughly quadruples at 3T compared with 1.5T. To keep SAR within federal regulations, some of the early clinical applications at high field were limited to imaging with a small field-of-view (FOV) or with pulse sequence compromises, such as longer TR, longer RF pulse duration with lower amplitude, or lower flip angle. Safety concerns for fast and strong gradients include acoustic noise and cardiac and peripheral nerve stimulation (PNS). The sound pressure level (SPL) generated by high switching gradient speed can reach extreme levels, in excess of 130 dBA at 3T. 19 Rapidly switched magnetic field gradients have been shown to induce electric currents in skeletal and cardiac muscles and peripheral nerves. 20-22 Eddy-current stimulation is major obstacle to overcome for clinical high-field imaging. Magnet design and siting were initial major barriers to the clinical acceptance of high-field MR scanners. For high-field MR to be clinically acceptable, the size of the magnet must be kept similar to current 1.5T systems. Prior to the late 1990s, actively shielded magnets >2T were not available, due to lack of clinical applications. However, as data supported the clinical benefits of high-field MR, industry leaders became more willing to invest in more compact magnet design. Actively shielded magnets at and above 3T field strengths were available by the turn of the new millennium. Different proprietary methods were developed by manufacturers to reduce magnet length while keeping the same aperture. Literature regarding this topic is limited. Nevertheless, the principal approach was to incorporate more active elements into the magnet. One valuable modeling technique relied on simulated annealing, which had been shown to be effective for compact gradients 23 and, recently, for magnet 24 designs. As of mid-2003, most major MR manufacturers were selling the latest generation 3T whole-body systems, for example, GE Signa Excite (GE Medical Systems, Milwaukee, WI), Philips Intera (Philips Medical Systems, Best, The Netherlands), and Siemens Magnetom Trio (Siemens Medical Systems, Iselin, NJ), with a magnet length of 1.5 m and an aperture of 60 cm. These magnets are actively shielded and weigh approximately 5 metric tons. The active shielding reduces the fringe field, keeping the 5- gauss line to only 3 m from the isocenter in the radial direction and about 5 m in the axial direction. These new specifications permit siting to be compatible with current clinical MR settings, allowing for easy upgrades and new installations. Clinical high-field, whole-body MR imaging would have not been practical without advances in specialized RF coil designs and parallel imaging. The development of phased-array coils was a major breakthrough in coil design. 30,31 The novel phased-array design provides increased SNR and reduced image distortion. The introduction of multiple receiver coils 32 for simultaneous phased-array acquisition (eg, parallel imaging), further accelerated the clinical acceptance of high-field imaging. Parallel imaging was not an overnight success. In reality, the idea of parallel imaging was introduced more than a decade ago. 32 However, parallel imaging captivated little attention until recent advances in pulse sequence designs and processing strategies such as simultaneous acquisition of spatial harmonics (SMASH) 41 and sensitivity encoding (SENSE). 33 In both of these novel techniques, the k-space is sampled with a reduced FOV smaller than the object being imaged. The reduced FOV images from multiple receiver coils are combined with information regarding the spatial sensitivity profiles of these coils to reconstruct a nonaliased full FOV image. Advances in pulse sequence development also play a major role in reducing B 1 inhomogeneity at high fields. Developments of B 1 inhomogeneity-compensated RF pulses are in continuous evolution. Adiabatic pulses were developed more than a decade ago to compensate for variable RF power and off-resonance effects. 49,50 However, adiabatic pulses are long and have high power consumption. New specialized short duration (1.3 msec) two-dimensional (2D) 51 and small-tip three-dimensional (3D) tailored RF 52 pulses with reduced B 1 inhomogeneity have been shown and implemented on clinical high-field MR scanners. 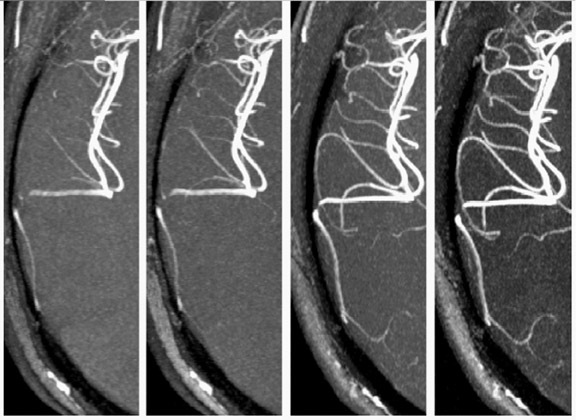 Current state-of-the-art clinical high-field MR imagers are equipped with special hardware capable of performing parallel imaging with reduced SAR and inhomogeneity effects. The latest generation MR imagers are preloaded with user-friendly software with specialized pulse sequences and processing power. These high-field, high-performance scanners are capable of producing morphologic and functional images with exquisite details without jeopardizing clinical safety. However, the drive to higher field strengths can succeed only if the new technology can produce improved patient care. Among the imaging subspecialties, brain imaging has been an area of clear benefits. However, imaging of other body parts (with FOV >40 cm) has also shown clinical utility. In the following subsections, the clinical benefits of high-field imaging will be illustrated. Improved SNR and CNR at high field in imaging the heart, 57,58 abdomen, 59 and the musculoskeletal system 60 have also been established. Clinical benefits in imaging these organs at high field are being actively investigated. Disease evaluation that could potentially profit from superior angiographic techniques at high field include vasculitis, vascular malformation, and atherosclerotic disease. The improved SNR and increased T1 relaxation time at high field translate to superior blood-to-background contrast in time-of-fight MRA. 61,62 By using a modulated magnetization transfer (MT) approach and an altered phase encode order to keep the SAR below 3 W/kg over any 8-second time period, 63 3D-TOF MRA images were obtained at 3T with improved background suppression (Figure 2). The improved SNR and/or reduced acquisition time at high field will also benefit time-resolved contrast-enhanced angiography, which relies on the rapid passage of contrast through the arterial tree. Longer imaging time at 1.5T has been a major limitation of this method, restricting the ability to resolve the arterial and venous phases of contrast enhancement. Similarly, longer acquisition time at 1.5T has also been a major obstacle to the clinical utility of phase-contrast angiography (PCA), which provides excellent visualization of vessels with high background suppression. In conjunction with parallel imaging, high-resolution isotropic whole-brain PCA can be achieved at 3T within a clinically acceptable time (<10 minutes). 64 Another area of benefit is carotid bifurcation imaging using the "dark blood" technique. Even with a 30% to 40% reduction in acquisition time, turbo spin-echo images obtained at 3T clearly resolved internal and external arterial walls that were difficult to delineate from images obtained at 1.5T. 58 Besides neurovascular imaging, high resolution (0.6 * 0.6 * 3.0 mm) coronary MRA with improved CNR and SNR has been reported by several studies. 65,66 With continuing advancement of the moving table technique at 3T, 67 clinical high-field, whole-body MRA will probably be available in the near future. While the role of H 1 MRS in tumor imaging and metabolic diseases has been clearly beneficial, even at 1.5T, high-field MR may improve evaluation of other disease entities such as psychiatric and developmental disorders. For instance, in an H 1 MRS study at 3T, increased NAA in the right frontal gray matter and reduced NAA in left frontal gray matter relative to controls were observed in children with autism. 90 Likewise, consistent and unobstructed quantification of glutamate has been achieved at 3T but not at 1.5T. 91-93 Because glutamate plays a central role in neurotransmission, the ability to obtain reliable measurements of glutamate may have clinical benefits, especially in the field of psychiatry. In imaging of other body parts, proton MRS at high field has been found to be useful in the evaluation of chronic hepatitis. 94 Besides proton MRS, fast direct imaging of phosphocreatine in the human myocardium is feasible at 4T 95 and may be of importance in the evaluation and management of myocardial ischemia. Imaging at high field strengths has proven to be superior, providing exquisite morphologic and functional details that would equate to enhanced patient care. However, the current environment of cost-conscious medicine requires more than just better patient outcome for the ultimate acceptance of high-field MR imaging. The new technology must also prove to be cost effective, which can be difficult to demonstrate. Several options to improve cost are available, when considering the following scenarios. If an MR unit is conducting >3000 examinations per year, and its average rate of growth is equivalent to the national average of 15% per year, 96 then upgrading or adding a high-field magnet should be strongly considered. A clinical 3T MR scanner with strong and fast gradients and parallel imaging capability costs approxinmately $600,000 to $800,000 more than a 1.5T scanner with similar specifications. Based on a report from Decisions in Imaging Economics , the typical fixed cost to operate a low-field magnet (¾1.5T) is approximately $700,000/ year. 97 The total fixed cost for a high-field magnet should not be more than $800,000/year because the main additional costs are likely secondary to maintenance and service costs. The reduced acquisition times will increase productivity while maintaining superior quality. The fixed cost per 3000 examinations is approximately $233 ($700,000/$3000). A 25% increase in throughput with a high-field magnet leads to a reduced fixed cost per examination of $213 ($800,000/$3750), or a total saving of $75,000 per year. Unfortunately, even such an optimistic estimate still falls short because a saving of $75,000 per year still requires roughly 10 years to compensate for the additional upfront cost of the high-field magnet. Another approach to reduce cost would be to perform contrast studies at half-standard dose, which can reduce the cost per examination by approximately $50. Again, hypothetically, if one-third of the MR studies require contrast, then reducing the contrast dose by half can potentially reduce operating costs by $50,000 per year (given a reduction of 1000 patients/year @ $50/patient). Thus, with these approaches to cost reduction, the greater upfront cost of a high-field magnet can be paid for within 5 to 6 years. Another option, which is most ap-plicable to practices with multiple MR scanners, is to consider organ-specific high-field MR scanners. For example, a 3T head-only MR scanner costs nearly the same as a whole-body 1.5T system. Academic centers and large radiology practices that perform >3000 head MRIs per year can triage these examinations to their dedicated head MR. Such an approach will provide better patient care and will still be able to reduce operating costs. Recent advances in hardware and software engineering have overcome some of the technical challenges of operating at high field strength. Development of short-bore magnets with improved homogeneity permits siting to be compatible with a current clinical MR setting. Novel passive and active ap-proaches have been devised to minimize the increased acoustic noise associated with stronger and faster gradients. Innovations in phased-array coils and multichannel receivers benefit high-field imaging by providing increased SNR, reduced image distortion, and reduced RF power deposition. Novel pulse sequence designs and postprocessing strategies further propel parallel imaging and reduce SAR. Whole-body high-field imaging can now be achieved within clinical safety standards. 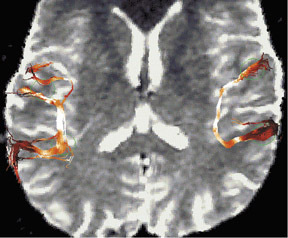 Also reviewed in the paper, abundant data support the clinical benefits of high-field imaging. With continuing progress, imaging at 3T or 4T field strength will soon be the standard of care in radiology practices. The author would like to thank Drs. Pratik Mukherjee, Max Wintermark, and Essa Yacoub for help with the preparation of this manuscript. Helpful discussions with Drs. 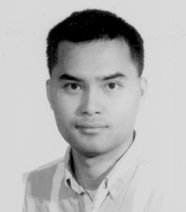 Xiaoping Hu and Gregory Sorenson at the 2003 ISMRM Meeting in Toronto, Canada are also appreciated. High-field, high-performance magnetic resonance: Technical challenges and clinical applications. Appl Radiol.